Rams: CB Lamarcus Joyner, CB Marcus Roberson, TE Justice Cunningham, OT Brandon Washington, TE Alex Bayer, DT Alex Carrington, DL Ethan Westbrooks. Redskins: QB Kirk Cousins, WR DeSean Jackson, S Brandon Meriweather, LB Keenan Robinson, DE Kedric Golston, OG Josh LeRibeus, OT Tyler Polumbus. Shoot, no Robinson on D, no Jackson on O! The Ribeye inactive to me is interesting. Does this mean that Long is finally moving up the depth chart? Missing our best players on both sides of the ball. We're a man with no legs fighting with one hand bound behind his back. Who starts in place of Jackson? Is it Hankerson,Moss or Grant? The Rams have a lot of injuries too... Even playing field IMO. A mere 'flesh wound,' Purdue. Think Monty Python and the holy grail and the delusional dark knight with no appendages! The best thing for this team right now is to lose out. Not so much because of the draft pick (because we have no one talented enough to pick the right guys anyway). But sometimes things have to get worse before they get better. I'm talking three of four seasons worth of this kind of losing in a row. Then and only then, do I believe that just maybe there will exist a slim chance that Snyder wakes up and hires a real team architect of a GM that is actually TALENTED. A point that's been beaten to death by every Skins fan for years. Until that happens, it will NEVER get better on any kind of sustained basis. NEVER. With no Jackson we will see some serious dink and dunk today. Screens to the backs and bubble screens to wide receivers. Looking at Jackson on the bench now, it's VERY hard to see him re-signing with us when the time comes. He's going to have no shortage of suiters, so I really don't think it's going to be about the money. That guy wants to win, and I think shortly after signing with us, it became apparent to him that it wasn't going to happen here. Converted a third and long! Way too many people at the stadium. Was hoping it'd be empty today. Damn, McCoy pulled a RG move that time.... Cmon Colt, you're the best QB on the team, now act like it! If it's going to happen, now is the time. We just delayed the Kickoff and gave the Rams less clock. At this point, I'm resigned to completed passes and first downs. I'm becoming an even bigger fan of his. at least he's down, but watch these zebras. Reprehensible. You are completely beaten down. Not sure that's all on Colt. Grant stutter stepped instead of taking off. If he had sprinted away the timing would have been right. He also gatored his arms, so the pick might have happened anyway. He's terrified of taking a hit. How could the refs not see that the first time they looked at it? 3rd and long for the opposition = first down. Set your watch by it. 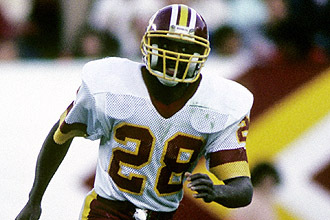 NO ONE bites on the play fake like the skins. NO ONE. Here comes another Hall of Fame tight end performance.